Originally known as Denby Dike, the area would initially have been very sparsely populated and likely to have small numbers of farmsteads situated well above the river Dearne, due to the likelihood that in the valley the land would have been marshy and prone to flooding, not good for grazing animals. 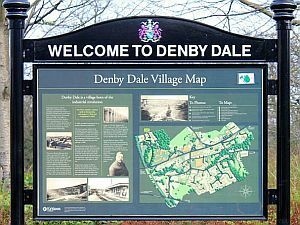 The growth of Denby Dale like many other villages in the West Riding of Yorkshire came about as a result of the Industrial Revolution, namely the mechanisation of the textile industry and improved transport and communications. In the late 18th century there was a corn mill along with fulling and scribbling mills. Even with the arrival of the textile industry, Denby Dike as it was still known in 1788, was a small and isolated place. It was the result of building two turnpike roads, Barnsley to Shepley in 1825 and Wakefield to Denby a year later, along with the arrival of the railway, that Denby Dike began changing to the Denby Dale we know today. Denby Dale is famous for it’s pie making to celebrate historical events starting from 1788/89 when the first Denby Dale Pie was baked questionably to celebrate the recovery of the recovery of George III from a bout of mental illness. The second pie was baked to celebrate the defeat of Napoleon at the battle of Waterloo. Pie number 3 was cooked to celebrate the repeal of the Corn Laws which governed the cost price of wheat. Queen Victoria’s Golden Jubilee in 1887 was the next big bake but it ended up having to buried in quick lime as it wasn’t fit to eat. The fifth pie, the Resurrection Pie was baked in September of the same year. In 1896 pie number 6 was baked to celebrate 50 years since the abolition of the disliked Corn Laws. 1928 saw the next pie, made to raise funds for Huddersfield Royal Infirmary. The Darby and Joan Pie was baked in 1964 to celebrate 4 royal births (Prince Edward, Lady Sarah-Armstrong-Jones, Lady Helen Windsor and James Ogilvy). The ninth pie was baked in 1988 to commemorate the bicentenary of the first pie. The 10th pie, to celebrate the Millennium, was baked in 2000 and served to an estimated 25,000 people.